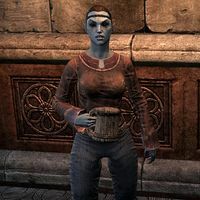 Minstrel Idria is a Dunmer minstrel who can be found in The Shining Star, the inn located within The Hollow City. She was one of its' inhabitants when the original city was dragged into Coldharbour and found herself lost in the Daedric realm. When Idira took shelter in a cave, she wound up having to act as entertainment for the eternal parties held by Nerazakan within the The Grotto of Depravity. After an unknown amount of time, she escaped the Grotto but was forced to leave her precious lute behind. When Idria is asked about it, she can reveal the Grotto's location and you will have the opportunity to recover the instrument. If you do return the lute, she will later perform for the customers in the inn. When she is first met, she will be depressed over the loss of her beloved lute. "I really miss my lute, F'lah." "Not much. At least, not much that I know of. I was a captive in a place called the Grotto of Depravity, a cave to the southwest of here. I escaped, but I wasn't able to retrieve my prized lute, F'lah. I feel so lost without it." If you find her missing lute in the Grotto, you can take it and return it to her. After you have reunited her with her lute, you can ask her history and how she escaped the Grotto. "I'm so happy I could just sing!" How did you wind up in the Grotto of Depravity? "After our city wound up in Coldharbour, everyone was scattered. I sought shelter in a cave. Big mistake. The Dremora in there, they were having some kind of sick party. Forced me to play and play and play." But you were able to escape? "After more years than I care to remember! They gave me short rest periods every few days, but they kept my lute so I wouldn't run away. Eventually, I decided I couldn't take it anymore. I left poor F'lah behind and made my way back here."